Denver tour company is throwing one of the biggest giveaways in Colorado for 420, including Redrocks concert tickets, accessories, and more from My 420 Tours Cannabis Tours in Denver. Denver, Colorado- Local Colorado tour company has been gaining popularity since opening their cannabis tour operation in 2014, just 2 years after folks in Colorful Colorado elected to legalize cannabis in 2012. 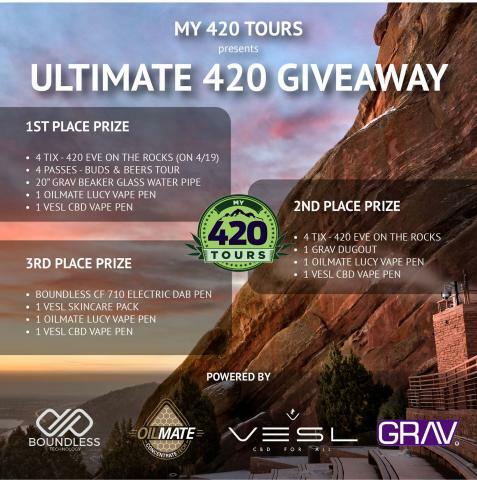 This notorious Cannabis tour company, My 420 Tours, who are located in the heart of Denver, Colorado have recently announced their huge contest in honor of the 4/20 holiday, which they are calling, “The Ultimate 420 Giveaway”. My 420 Tour, Denver’s premier tour company has an easy form to fill out on their site and company says folks can enter to win the ultimate 420 giveaway by subscribing to occasional mail from the friends in high places at My 420 Tours and My 420 Tours select Giveaway partners. The company concludes that the winners will be announced at 12 PM MST on Thursday, April 18, 2019, and advise anyone interested in entering the contest to see the complete details and rules.